Yes, the PC police are everywhere, and they’re vicious. Palin will be officially launching her book in Bethlehem, Pennsylvania. And no one is gonna tell her how to do it, not a chance. 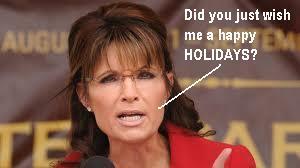 Like the British ignoring Paul Revere’s warning, Palin is listening to no one on how the rollout will proceed. According to various reports, she plans to sign copies of her book from beneath a cresh made out of steel. And the Three Wise Men will be replaced by Three Stooges impersonators wearing Tap-Out t-shirts and riding little BMX bikes. It’s gonna be a busy holiday season for Sarah. Once this book tour is done, she’ll be off to promote a follow-up book titled The Perpetual Victim’s Guide To Ringing In The New Year. In my experience, the attacks usually stop once you do that. So do the invites to Christmas parties. But the office parties are a totally different matter. As a member of the vicious politically correct police strike team, I can confirm that we refudiate Christians every chance we get. She looks like that woman who used to be on SNL. She does know Bethlehem, PA is not THE Bethlehem right? Probably not. And the original stable was not made of Bethlehem steel. Probably not, but the rollout is this week (I think). You should go and report back to us Donna!